3.1 How do I use a Tire Inflator? 3.2 What are the benefits of having a tire inflator? Many people do not realize it but tire pressure is critical to many driving processes. 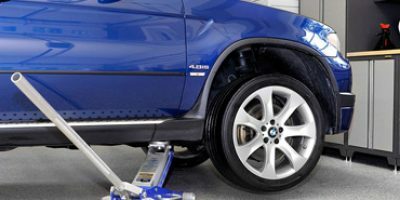 Among the most important of them is safety, because improper tire pressure can cause blowouts and ill handling during adverse weather conditions. Tire pressure also plays a role in how much gas mileage your vehicle gets and how smooth your vehicle drives too. That is why it is recommended that everyone own a tire pressure checker and a device to inflate your tires easily when they need it. 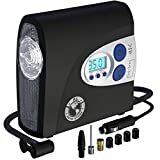 This article contains several tire inflator reviews which will help you learn to identify what the best tire inflator is for your needs. There is nothing better for every vehicle owner than getting this Astro tire inflator. You can check the pressure, add air or deflate your tires only with one product and therefore it will save you a lot of hassle and keep your tires in a good condition at the same time. We liked a lot of things about this tire pressure gauge. The first one is the wide range of measurements that it can provide. By simply pressing the buttons under the backlit LED screen, you can choose the gauge you want – PSI, KPA, Bars or kg/cm3 . Then comes the 0.1 display resolution and the fact that this tire inflator is actually suitable for air compressors with ¼ in. NPT output. Another thing that caught our attention is all the accessories this product comes with. 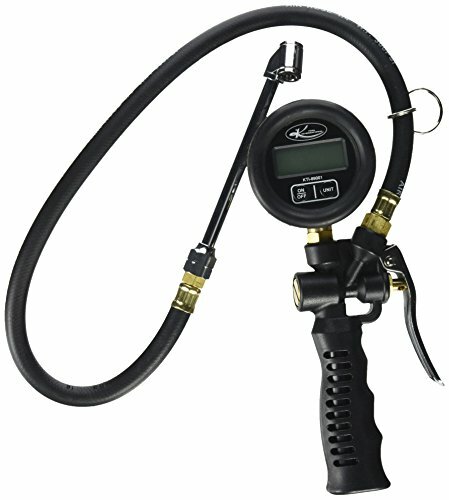 You will get a tire inflator with steel and brass components as well as 4 valve caps. Finally is the 3-year warranty which is not something to brush aside. Unfortunately, you will not be able to use this product with portable air compressor and you will have to change the 3 AAA batteries regularly as well. This is a great tire inflator that can handle most any normal tire inflation task. It runs off the battery power of your car (must have a 15 amp fuse) and can inflate a standard size car tire in less than three minutes. That is some serious inflation power for a small portable inflator such as this one. It plugs right into your vehicle’s power accessory part and can handle a variety of different inflation needs. It comes with adapters for filling inflatable toys, bicycles, sports balls and just about anything else you can think of. We really liked how this unit stored easily. It features a coiled plastic hose that rolls up almost flat and the unit itself is only 7 x 7 x 9 inches. That is small enough to carry in the trunk of your car easily. It even comes with its own handy carrying bag. A few us of thought this unit was a little bit slow. While you cannot expect a tire inflator that is powered by your car to be fast we have seen models that run off a vehicle’s power perform much better. 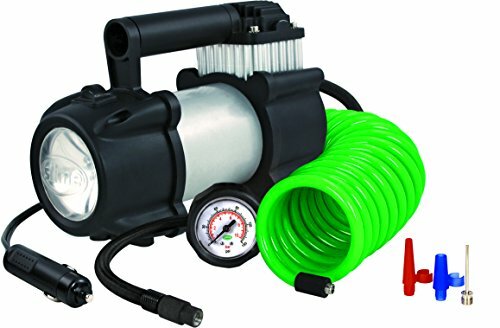 This is a great tire inflator to own if you have a compressor that can fill tanks of compressed air for you. It attaches in no time at all and makes short work of filling such things as tires, inflatable toys, and air mattresses. 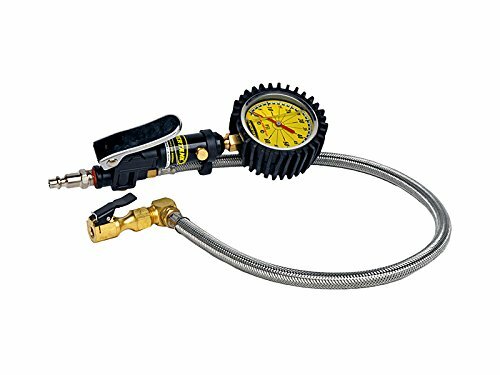 It comes with a heavy-duty pressure gauge that is accurate up to 60 PSI and it also has an easy to use thumb trigger built right into it. This model tire inflator can also double as a tire pressure tester when it’s not hooked up to a tank of air. 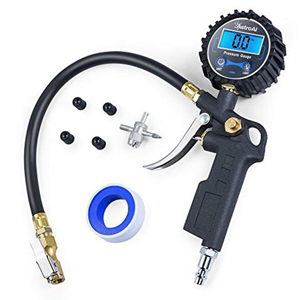 The best thing about this model tire inflator is the pressure gauge itself. It is built to last. This gauge is liquid filled for long life and accuracy; that also makes it usable even in colder weather. Having the gauge wrapped in a rubber coating makes it easy to handle and adds to the durability of this tire inflator too. Most of us here prefer tire inflators that make their own compressed air; it just makes them that much more convenient. 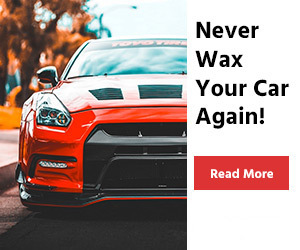 This model does not do that. It relies on you to carry a prefilled tank of compressed air and when that runs out you can’t inflate anything else obviously. This is a very good tire inflator that KTI has designed here. It makes the task of filling tires and other inflatables easy when this tool is hooked up to a compressor or tank of compressed air. 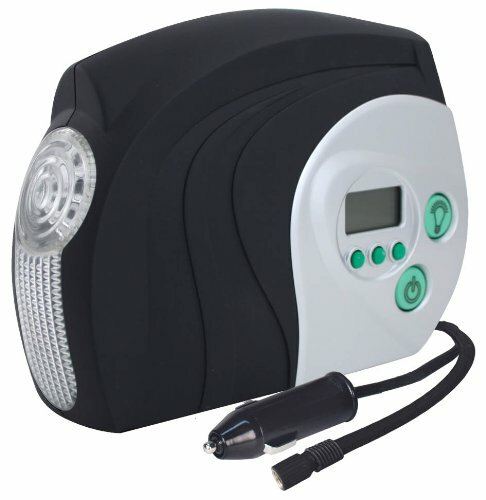 This model tire inflator consists of an easy to press trigger, backlit digital controls and 17 inches of hose in which to work with. It is accurate within a plus or minus 1% range and can handle tire inflation tasks up to 150 PSI. Speed is the best thing about this tire inflator. When you have a tire inflator that hooks to a compressor unit or tank of compressed air they are much faster than vehicle-powered tire inflators are. So you can avoid the typical long wait time you get with self-powered tire inflators. Once again this is a tire inflator that requires it to be hooked up to a tank of compressed air or an air compressor. It is not a stand-alone unit which means once the air in the tank is gone you will have no more inflation capability. Joes Racing is a company that is known for making some of the most accurate and reliable tire inflating equipment in the business. This model here keeps with that tradition. Once hooked up to a tank of compressed air it will make short work of any tire inflation task up to 60 PSI. It is an inflator that is both easy to use and easy to store. You simply cannot beat the accuracy of this model tire inflator for the reasonable price that you will pay for it. We all really liked the pressure gauge on this model. It is an analog gauge that is both accurate and easy to read. It is also a very durable gauge that is blanketed by a nice rubber coating too. There were a couple of things we disliked about this model tire inflator. For starters, we thought the length of hose that comes with it was a little short. The handle and trigger area also seemed to be a little bit bulkier than we would have liked. Here is another of the fine Slime Pro Power line of portable tire inflators. This model conveniently plugs into your vehicle’s auxiliary power port. That means you will have the ability to inflate tires wherever your vehicle can go. It does not matter whether you are at the beach or in the woods you will always have the ability to keep your tires properly inflated. It includes 16 feet of air hose and will inflate any size tire up to 150 PSI. We loved how compact this unit is. It only measures 7 x 7 x 9 and weighs a mere 5 pounds. It will easily store and go with you anyplace that you take your vehicle. It comes complete with a carrying bag and accessories that will let you fill a lot more than just car tires with it. The air hose on this unit is a little bit to the flimsy side. You will also need to carry some spare 15 amp auto fuses with you because this machine blows them while running once in a while. This is a very good tire inflator when it is coupled with the right source of compressed air. The gauge on it is very accurate and it is built very sturdy also. It is a mechanics grade tire inflator for sure. 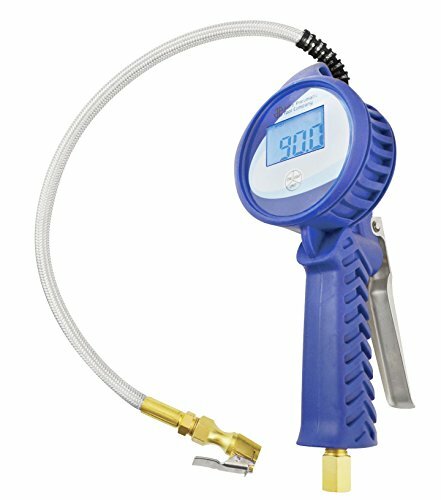 It features an easy to read and highly accurate analog pressure gauge that is shrouded in a rubber sleeve. The hose that comes with it is made of durable and nearly rustproof stainless steel. This model inflator can even be used with CO2 and Nitrogen gasses. The PSI range on this model is very good. It can handle inflating tires up to 60 PSI while at the same time being able to handle 200 PSI of compressed air coming from the supply. It is also one of the most accurate pressure gauges we have ever tested. This is not a stand-alone unit so you will need to also have a source to supply you with compressed air. So this model tire inflator is somewhat limited to shop or home use under most circumstances. There is simply much to like about this tire inflator from PI Auto store. 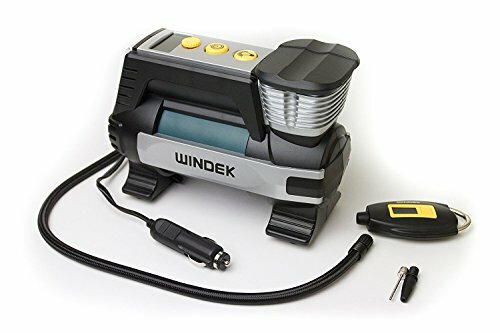 It is loaded with special features that make this an ideal tire inflator for home use or to take along with you in your vehicle. It runs of both 12 volt DC and 110-volt AC power supplies. It seals nicely when attached to a tire valve stem because it threads onto it as opposed to being clamped onto it. It even has a digital pressure readout and an automatic shut off when the set tire pressure is reached. 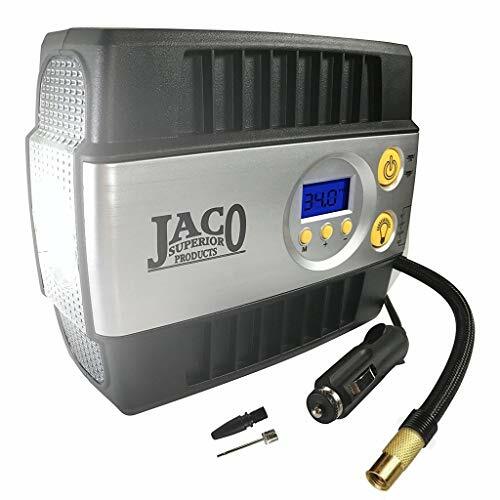 We have said time and time again that some of the portable self-contained tire inflators are underpowered because they run of the DC voltage on your vehicle but this model tire inflator gets around that. It has a switch where you can use your household 110v current if you are not on the road with it. It gets a lot more power and works better then. We did have a few concerns about this product. One of them is we question its durability a little because if its softer outer shell that keeps it lightweight. The other was minor and that is with the cords and hoses this unit has it does not pack into its carrying bag easily. This tire inflator is very similar to their 3082 model except it has a digital readout instead of an analog one. It is a well-well designed unit that is very simple to operate. Once hooked up to a compressed air source it can really handle just about any tire inflation task very easily. It features a stainless steel hose that is braided for the ultimate in durability. This inflator is also very accurate and its digital pressure gauge is backlit for easy low light level use. This is one durable tire inflator, to say the least. We all loved the very strong braided hose that comes with this model inflator. All the pieces of equipment on it are built to last and the pressure gauge and handle grip are encased in a rubber shroud for easy handling and protection. What were some of the concerns we had with this model? We did not like how hard it was to change the battery for starters. It seems like Astro could have come up with a better design here. The end of the tire inflator handle that screws onto the air feed hose was built a little awkward also. Who better to design a tire inflator than a company whose very name is the biggest in the entire tire industry? Good year knows all about what it takes to properly fill tires. That is why they designed this nice little 110-volt model inflator that is perfect for home or light commercial use. Having plug-inconvenience gives this model a little extra power and the gauges on the device are accurate and easy to read. We really like that this model tire inflator from Goodyear comes with everything you need. It has several adapters for blowing up other items besides tires and it also includes a generous 24 feet of air hose so you don’t have to constantly move the compressor around. It is also a very quiet running model, to say the least. There are a couple concerns we had with this model. The adapter to hook onto the valve stem of the tires you want to inflate is a screw on type which makes the task a little more tedious. This unit also struggles a little bit to inflate high-pressure tires like bicycle tires that require 60 – 70 PSI. Here is another 12 volt, self-contained tire inflator that we can’t say enough good things about. JACO has come up with an easy to use and efficient design here. This tire inflator will make an excellent addition to the tools you have at home or it’s portable enough to store right in your vehicle. 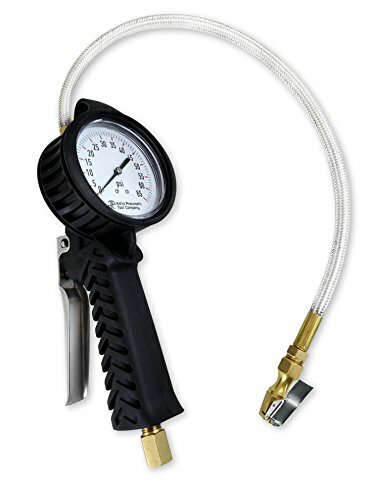 It has a 24-inch inflation hose, the gauge is extremely accurate and the controls are backlit for easy night use. We really liked how easy this model tire inflator is to use. It has a generous 10-foot cord so you don’t have to put the main part of the unit inside your vehicle. It also has an easy to see digital readout and all the controls are done simply by pressing the oversize buttons on the unit itself. As we inspected and used the unit it appears to us there might be some durability issues with this unit. 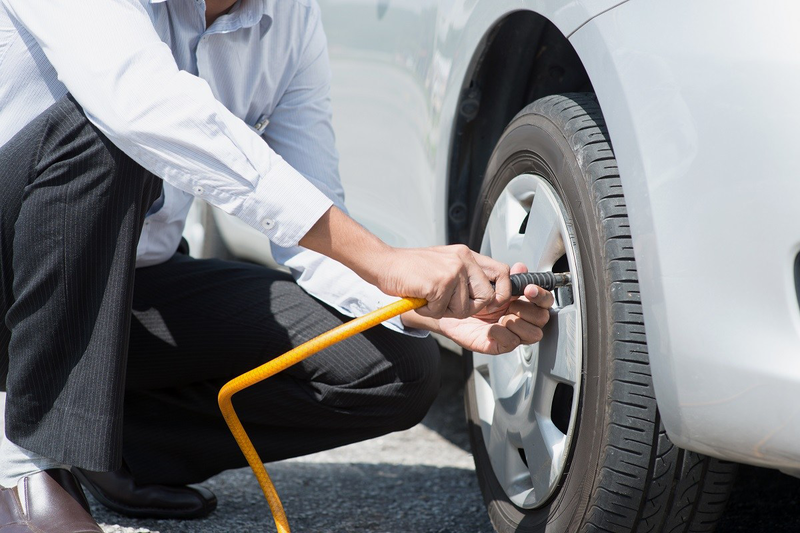 As with most 12-volt tire inflators, it also takes a long time to build up enough pressure to fill a car tire. 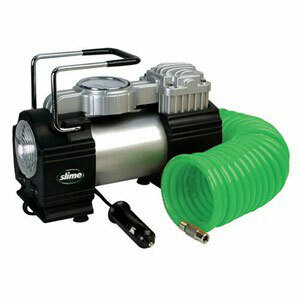 This highly portable unit manufactured by Slime Inc. is a very versatile tire inflator to own. It has very simple to operate push button controls and the readout is done by using an easy to see digital display. It also has a rubberized finish to keep it from getting dinged up as you use it and a very powerful LED light built right into it for nighttime use. With a combined 12-foot cord reach and the capability to inflate tires up to 35 PSI, it makes a nice addition to any home garage or to carry it with you in your vehicle. The price point on this capable 12-volt tire inflator is incredible. So much so that anyone can afford the money to purchase one of these to carry around with them in their vehicle. It is a very lightweight and portable tire inflator. This unit is not as sturdy as some of the other tire inflators that slime manufacturers. You may have some durability issues here. It is also very slow at inflating objects that require a high PSI in them. This is an amazing self-contained tire inflator for the price you pay for it. It is a unit that works faster than most tire inflators that are vehicle-powered and it is compact enough to take along with you in the trunk of your car. This unit is durable due to its heavy-duty construction and can easily be used at night with its backlit controls. It also comes with a carrying bag and several accessories such as a separate tire pressure gauge. Definitely, the best thing about this model tire inflator is the digital readout and controls. It makes the task of inflating your tires so simple. It has a switch that will even shut down this unit’s compressor when the desired PSI is reached on what you are filling. It’s true that this inflation unit is faster than some vehicle-powered models we have tested but it is still very slow when it comes to filling your vehicle’s tires. So if you need to inflate things fast it is better to use an independent tire inflator hooked up to a source of compressed air. Just by reading through our reviews you have probably realized what a huge variety of tire inflators there is in the marketplace. There definitely is no one size fits all tire inflating solution. You really have to buy a tire inflator based on your own individual needs. In order to do that, you will have to know what characteristics of a tire inflator are important to factor in your buying decision. Here is a list of what we feel are the most important considerations when it comes to buying a tire inflator for yourself. Price is usually a big factor in most people’s buying decisions. Although as a general rule most tire inflators are not extremely pricey items, some people don’t like to spend close to $100 on this type of purchase. So set a budget for yourself on what is a reasonable price you are willing to pay for your tire inflation needs. This means that the unit produces its own supply of compressed air. These are usually portable and lightweight devices that are easy to store in your vehicle so you can take them with you. This means that unless this model tire inflator has an outside supply of compressed air coming to it then it will not function. These type of tire inflators are usually very durable and often are the choice of professional mechanics who own separate compressors. These are models that plug into the cigarette lighter or auxiliary power plug in your vehicle. They are very convenient tire inflator models because they can be kept with your vehicle and used whenever you need them. A big problem with these is that they fill a tire very slow. AC powered tire inflators have the disadvantage that they cannot be powered by your vehicle but they are more powerful and fill faster than 12-volt DC-powered units. They are slightly bigger than DC powered units but still usually very portable. These are the tire inflators that offer the best of both worlds when it comes to electrically powered inflators. They have a toggle switch that enables them to either be plugged into a power source in your vehicle or they can be switched to run off of 115-volt AC plugs. Many model tire inflators do not make their own compressed air as was mentioned above. 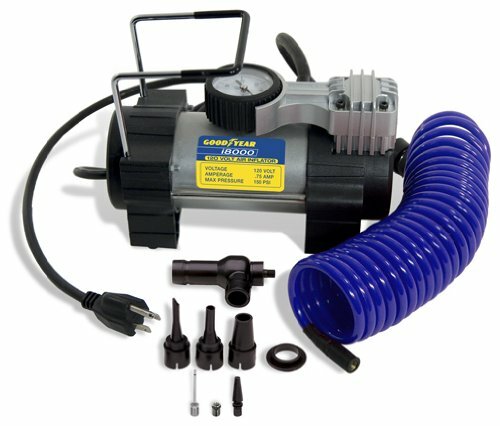 That means in order to use this type tire inflator you will need to own a separate compressor too. The inflators tend to be heavy duty and that is why they are preferred by mechanics. They are also are a much faster way to fill tires and can better handle filling tires that require a PSI level. Many electric model tire inflators have limitations on the amount of PSI they can input into a tire. They are fine for inflating car tires to around 35 PSI but they are fairly useless in situations where you have bike tires or other tires that require higher PSI levels. On the other hand, tire inflators that are supplied by means of external compressed air can usually easily handle high PSI inflation requirements. So make sure you have an idea of the PSI ranges you need to inflate your tires to and be aware of the tire inflator you are thinking about buying can handle that range of PSI. If you want to keep your tire inflator in your vehicle then you will need to buy a model that runs off of 12 volts DC so you can plug the unit into your car’s power point. Tire inflators that require 115-volt plugs to run or need a separate air supply are much less portable than tire inflators that run off of 12 volts DC. Hose and cord length is important to consider too. These are factors that make getting to the tires more convenient so you can fill them easier. Of course, tire inflator models that require a separate air supply to power them do not have a power cord, but for those model tire inflators that do, a longer power cord means you will have to move the unit less as you are using it. The length of the fill hose is important to consider also because valve stems are not always in an ideal position to hook up to them when you go to fill the tire. Generally speaking, the longer the length of your fill hose the easier it will be to place your adapter on a tire’s valve stem. You will usually have a choice between two different styles of tire pressure gauges that you can buy a tire inflator with. These are gauges that have a needle that identifies the PSI of a tire by pointing at a corresponding number on the front of the gauge. They are harder to see than a digital readout but many professionals think they are more accurate. These are by far the easiest of the two gauge types to read. They need to be backlit in order to see them at night. They are great for non-professionals who do not require extreme accuracy when inflating tires. You want any tire inflator you buy to be as versatile as possible. That means if it has some nice accessories that come with it that is a great bonus. Things such as multiple adapter heads for filling such things as inflatable toys and air mattresses can make your tire inflator an even better investment. If the manufacturer supplies a carry bag with the purchase that will make the unit much easier to store safely or will help make it convenient to take a portable tire inflator on the go with you. It is always important to know what the warranty is on any tire inflator you are thinking about buying. The longer the warranty the more peace of mind you will have that you will not have to buy another tire inflator for a long period of time. Are You a Do-It-Yourself kind of person? A torque wrench is an essential buy for you! How do I use a Tire Inflator? A tire inflator is a pretty simple device. It is a means to help you transfer compressed air from a supply into an underinflated tire where it needs to go. It has two distinct ends to help with this process. One end has an adapter attached to it so the unit can form a seal with the tire’s valve stem and the other end coupled with the incoming compressed air supply. The tire inflator has other features too that assist with this process and the most important of which is the pressure gauge. This will tell you what the current pressure in the tire you want to inflate it and then it will help monitor the compressed air input as you are filling the tire so you will know when you have reached the desired PSI. It most likely will also have a handle that needs to be depressed that allows the compressed air to pass from the supply line into the tire that needs to be filled. What are the benefits of having a tire inflator? 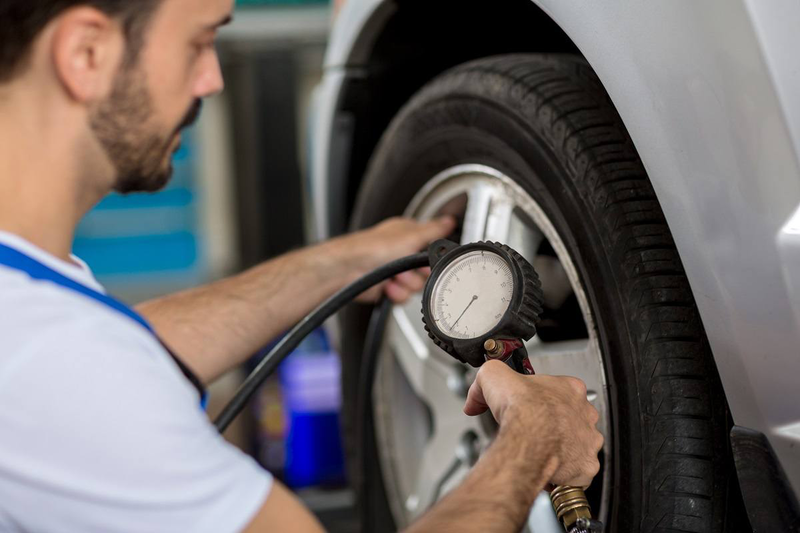 So even though tire pressure may not seem like a big deal, it directly impacts several areas of concern when it comes to operating your vehicle. Check out our essential guide, reviews of the most popular all-season tires and all-terrain tires for your car! Don’t buy a snow chain before reading these reviews. You should have no problem at all finding the right tire inflator for your needs. There is just so much variety to choose from in the marketplace. 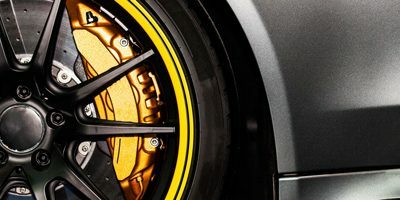 Use the information supplied here to help you make a sound buying decision to help you find the best tire inflator for the money. Keep in mind that purchasing one of the many units that we did tire inflator reviews on is never a bad idea.